I had some already coloured images from different Lawn Fawn sets (I used Shinhan markers), but wanted to create a cute scene for them. I started with adhereing back striped washi tape on the top and bottom of an A2 size top folding card base. Then i took a piece of white cardstock and die cut the dges with a scalloped edge die. I also cut some grass fom patterned paper, a picket fence from white cadstock and two stitched strips of glitter cardstock (Picket fence die too). From the same glitter cardstock i die cut the word Enjoy also. Another patterned paper piece serves as the sky and I adhered the sentiment die cut on it. I stamped the rest of the sentiment under in black ink and assembled the layers. I popped up the bunnies with 3D foam tape. A bit of clear sparkle and glossy accent on the packages and some detailes with a black glaze pen / white gel pen finished it off. 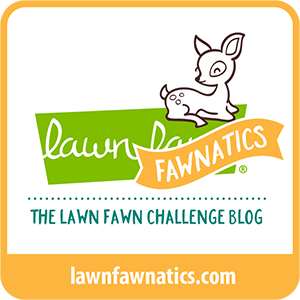 I will submit this to the above mentioned Lawnsfawnatics challenge. As on the Simon Says Stamp Wednesday Challenge it is Anything goes, i wil link this card up there too. Hope you like it and will return soon. 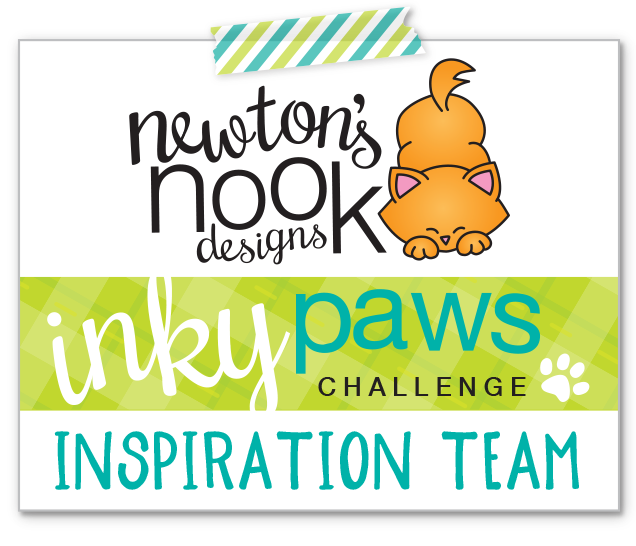 Today I brought you something very springy, a card I made for the current Inky Paws Sketch Challenge #43 at Newton’s Nook Designs. I had some pretty eggs already coloured a while ago (stamped on Bristol Smooth cardstock and coloured with Zig Clean Colour Real Brush markers) from the pretty Beautiful Spring set. I just added some sparkle with Spectrum Noir Shimmer pen, glossy accent and tiny white pearls. I covered the bottom and top part of an A2 top folding card base with striped patterned paper. I cut a smaller piece of white cardstock, decorated the bottom of it with a stitched scalloped border die from SSS. I stamped the Hungarian sentiment (Happy Easter) from Krokihobby in purple ink on the right upper corner. I also cut a grassy hillside border (Lawn Fawn) from green patterned paper (Doodlebug) and mounted it with 3D foam tape on the white panel. I placed the eggs behind the grass. I also cut a bow and string (Pretty Pink Posh die) from pink cardstock and placed a little gemstone in the middle to finish it off. 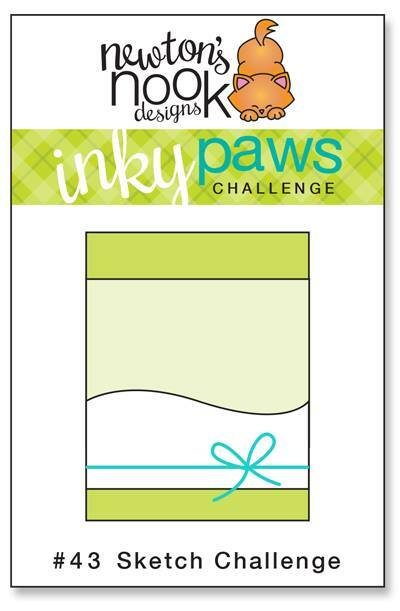 I will submit this project to the above mentioned Inky Paws Challenge. I hope you like my Easter card and will return soon for more inspiration. 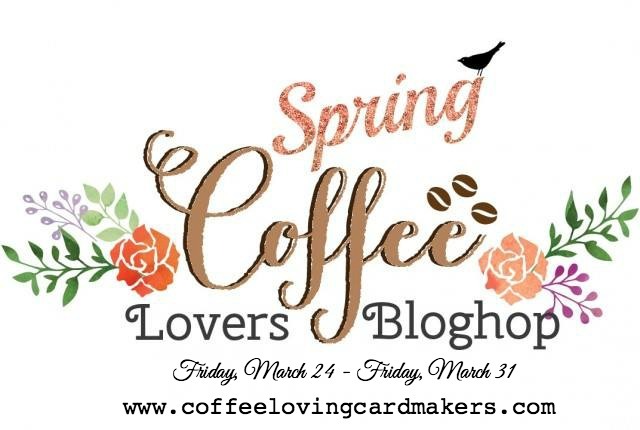 I have another card to share with you for the Spring Coffee Lovers Blog Hop. I wish I would have time to make more but as we are travelling after tomorrow and I will not have y crafty things with me I doubt it…lets see.. But back to the card, I started with a piece of Desert storm cardstock and ran it through the Big Shot machine with a wonderful stitched background die from Simon Says Stamp and stamped the sentiment on the left bottom corner in black. I also cut a strip of patterned paper from the Doodlebug Cream and Sugar pad, glued a thin strip of blue glitter paper on the edge of it. Next I die cut a Pierced heart (MFT) from another patterned paper from the same paper pad to hold my two coffee cups from the Simon Says Stamp Coffee and tea set. I stamped them on alcohol marker friendly paper and coloured with Shinhan markers. After fussy cutting them, I mounted them on the heart with 3D foam tape. I also added Spectrum Noir clear shimmer and some glossy accent. I am linking this up to the Spring Coffee Lovers blog hop. As a finishing touch I used some natural twine tied in a little bow on the top of the card. I hope you like it and will see you soon. This is my second post today as I wanted to participate in the Spring Coffee Lovers blog hop. I needed a tea card also for a special someone and it just fit the challenge. I started with trimming down one of my marbled backgrounds which I made 2 days ago using shaving cream and distress re-inkers. I cut a pretty Fancy scalloped circle from Lawn Fawn from cream cardstock and a Simon Says Stamp Basic Banner from Audrey blue cardstock to hold the sentiment. I used the SSS Coffee and tea stamp set for the teacup and the sentiment, which I heat embossed on the blue banner. The teacup I coloured using Shinhan markers and fussy cut it out. I adhered it with 3D foam tape above the banner. A little Spectrum Noir shimmer pen on the tea and a few Doodlebug glitter drops on the side of the banner finished off my card. I will upload this project to the Spring Coffee Lovers Blog hop and to the SSS Monday Challenge Layer it up and Wednesday Challenge Use more than one die cut/punch. As the card is mainly green, I will also submit it to the SSS Work it Wednesday as my last entry. I am popping in quickly to show you another idea I had for using handmade marbled backgrounds (more about the technique you fin on Stamp TV by Gina K Designs). I wanted something green, so I made a few marbled backgrounds using shaving foam and distress re-inkers (Twisted Citron, Cracked Pistachio and Mowed Lawn). After drying I white heat embossed the flower image from the Paper Smooches Best Buds stamp set in the middle. I die cut the PS Celebrate die from dark green cardstock and glued it at an angle on the embossed flower. I die cut two frames, one white (Mama Elephant Madison Avenue) and one dark green (Lawn Fawn), layered them on the background and adhered it all on a white card base. Very simple card, but involves a lot of techniques which I love. 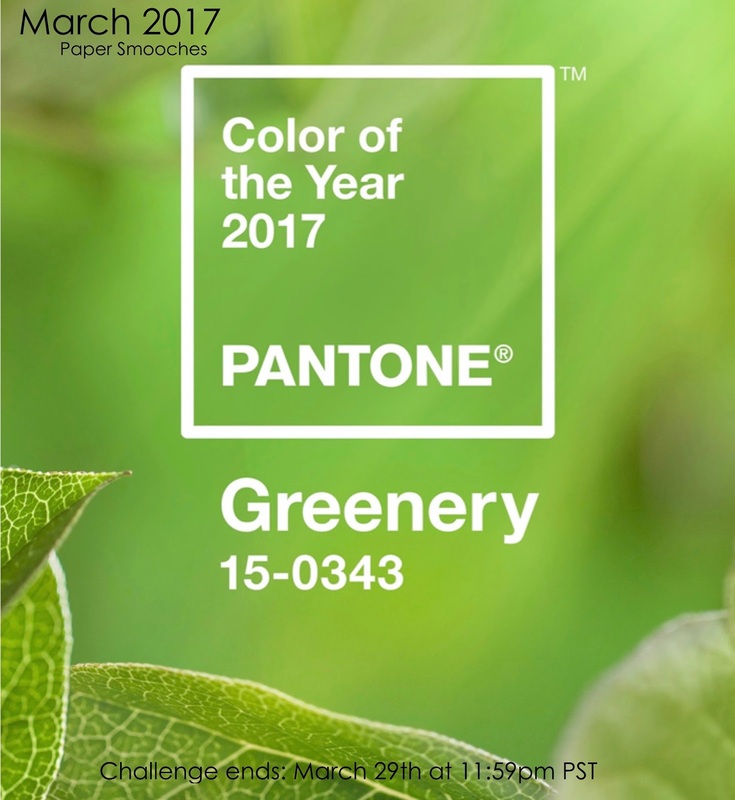 I will submit this to the PS Monthly Challenge: Greenery, to the Simon Says Stamp Work It Wednesday Green and to the Simon Says Stamp Monday Challenge Layer it up and Wednesday Challenge Use more than one die/punch. I hope you will come back soon for more inspiration. 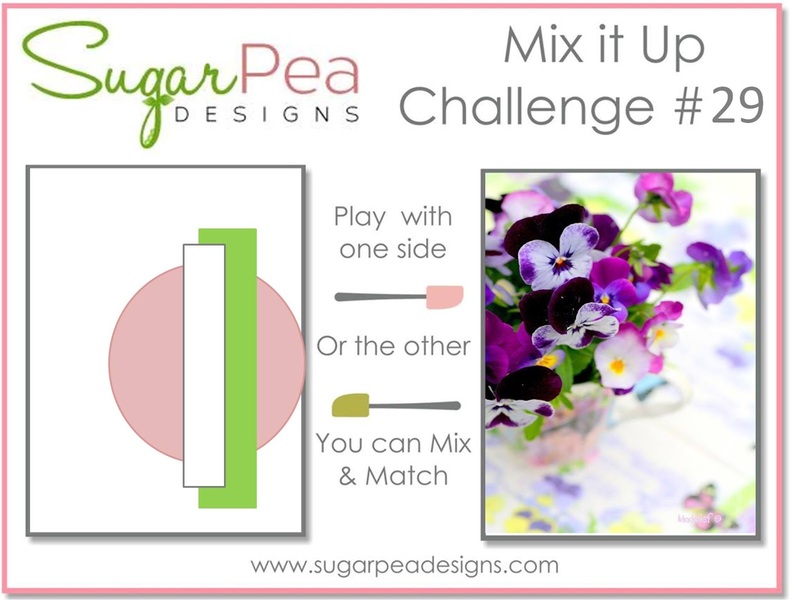 I am popping in quickly to show you the card I made for the latest Sugar Pea Designs Mix it up challenge. I started with stamping the bunnies on marker friendly paper and coloured with Shinhan alcohol markers. Then I fussy cut the image and ran a black marker on the sides of it to make it perfect. I also die cut a light blue circle as the background of my scene, grass from green cardstock and some trees using MFT dies. I adhered yellow gingham paper on an A2 sized card base and stamped a Hungarian (blessed Easter) sentiment from Krokihobby on the bottom of it in black. Then I adhered the scene, I used some 3D foam tape to mount the bunnies. I also cut some Easter eggs from a pretty patterned paper and added them behind and in front of my bunnies to make it more Easter like. A little glossy accent on the tie, black glaze pen on the eyes and some details with a white gel pen finished it off. I will submit this card to the Sugar Pea Designs Mix it up challenge #29 and Simon Says Stamp Wednesday challenge Use more than one die and Simon Says Stamp Monday Challenge Layer it up. I hope to see you back here soon with another card. It is me again, today I wanted to show you a card I made for my daughter, based on the sketch challenge at MFT Card Challenges for this week. I silver heat embossed a tiny star background stamp on white cardstock and added some purple and blue distress inks in the middle of it. Then I die cut a light grey cardstock using the scalloped basic edges 2 dies from MFT and I also die cut a stitched circle in the middle of it. I took some scraps of purple cardstock and die cut a stitched banner for the sentiment and also a tiny flag from the stitched banners MFT die set. I stamped the bunny and the little sleeping bear on marker friendly cardstock and coloured with Shinhan markers. I used the coordinating dies to die cut it. Then I added a bit of glaze to the noses with a black glaze pen. I also added some white dots to the blanket, but I didn’t like it so quickly went over it with my Spectrum Noir shimmer pen. As it is quite new, it put too much shimmer down which helped to remove the dots. I rubbed the excess off with my fingers. 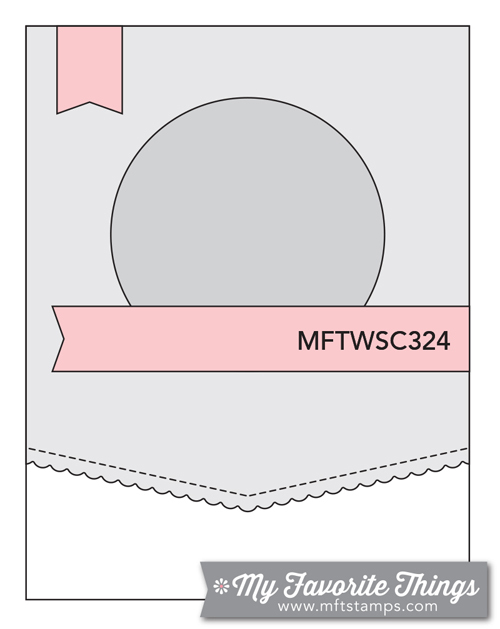 The sentiment is from the same stamp set, white heat embossed on the stitched banner. I used 3D foam tape to adhere the card, and 2 bluish purple enamel dots to “hold” the sentiment banner. 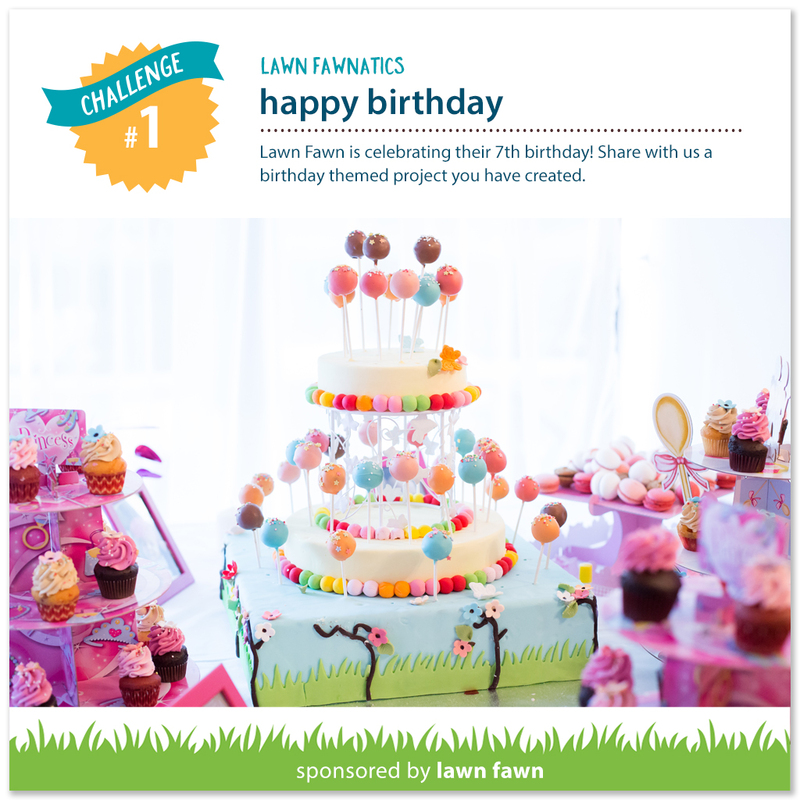 I will play along with this card on the MFT Sketch Challenge #324 and Simon Says Stamp Monday Challenge Layer it up. I hope you like my card and will see you back soon!